Corrugated metal roofing and siding are common on industrial and storage buildings. It is relatively inexpensive and durable, although not necessarily the best insulator of heat or noise. It is also a great choice for modelers who enjoy creating a run-down weathered look for a building. Only basic tools are required. A hobby knife, sandpaper, glue, and a paintbrush. The weathering and detailing techniques shown here will work on plastic kits as well. You can make a custom roof or wall for any building for just a few dollars and a few minutes. There are many commercial styrene sheets molded to resemble different types of corrugated and another siding. The roof shown here for this project came from a left-over scrap from a scratchbuilt coal unloading shed. Begin by cutting the sheet to size. Cutting and gluing styrene is easy. After cutting to size, sand the edges for a smooth cut. For larger roofs, multiple panels can be joined by adding a splice in the back and gluing with styrene cement. For a thinner profile, you can sand down the back of the sheet. For a roof like this, you only need to sand the edges. This will produce a scale profile at the edges but preserve the strength of the sheet in the center. A powered sander makes this work go much faster. By using a heavy grit and high speed, not only were the edges of this roof thinned, enough heat was created to add a few extra ripples and bows to the interior of the roof as well. This extra touch helps eliminate the "plastic" look and errors will be easy to cover up with patches if necessary. Patches are a common feature on older metal roofs. The patches are often additional metal sheets, sometimes with different corrugation patterns which create a patchwork look on the roof. These newer panels can be made by using the styrene sheet as a master. 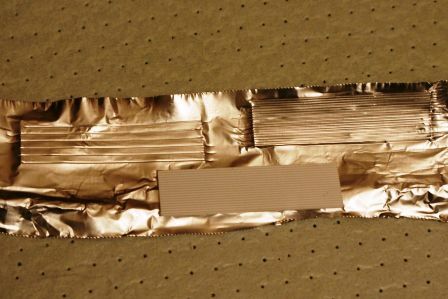 Lay a sheet of aluminum foil on top of the styrene and use your fingernail to press the foil into the corrugations. For more variety, skip a few ridges and create different patterns. A single scrap of styrene can provide an unlimited supply of foil panels. You could build a building using conventional styrene, gatorboard, or balsa wood and line it with these panels for a low-cost but high-impact structure. The panels also make a great addition to scrapping yards or loads. The thin foil is easy to bend into any shape, making great scrap. After embossing the panels, the foil and the roof itself must be painted. Most aluminum foils have one side that has a more shiny surface than the other. Both sides will accept spray paint, but the matte finished side generally yields better results. You could leave the foil unpainted to represent brand new material, but it won't take weathering powders very well. A light gray is a more realistic option. Both the foil and the styrene are easy to paint with spray paints. Use flat colors. There are many shades of gray available, including very inexpensive primers for bare metal. You could also use other colors to represent painted metal. Use light coats, and feel free to mix a few colors. Don't forget to get the edges of the styrene. And, if your roof has an overhang, you'll want to hit the underside as well. Once the paint has dried, you can cut panels from the foil using a sharp knife. Before proceeding to the next step, install the styrene roof or walls on the model. The final step, weathering, brings it all together. Add the foil patches to the styrene roof using cyanoacrylate (CA) or simple carpenters glue. You can leave some of the corners turned up a bit for more effect. Panels can be put on in any direction and overlapped. Finish it all off with a coat of weathering chalks. Mix oranges and browns to create different ages of rust. Accent the panels by weathering them to different colors. To model peeling paint on some of the patches, appropriate drybrush colors onto the foil before adding the powders. Finish by applying a coat of clear flat finish to seal it all in. Your new corrugated metal roof, walls, scrap pile or gondola load, is ready to go and sure to attract attention.